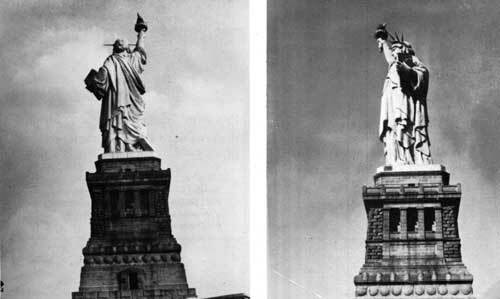 Four views of the Statue of Liberty. 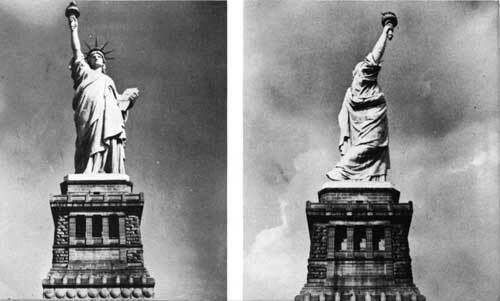 THE STATUE OF LIBERTY was declared a national monument by Presidential proclamation on October 15, 1924, the monument boundaries being set at the outer edge of old Fort Wood. The War Department continued to administer the entire island until, in 1933, again by Presidential proclamation, the Statue of Liberty National Monument was transferred to the jurisdiction of the Department of the Interior, the Army retaining the remainder of the island as a military post. In 1937, another Presidential proclamation declared the Army Post abandoned and jurisdiction of the entire island passed to the National Park Service, Department of the Interior. While Bedloe's Island, with an area of approximately 12 acres, is located in the Upper Bay of New York Harbor, it is geographically in the territorial waters of New Jersey. The island itself above the mean low-water mark is in New York State, pursuant to an interstate compact entered into by New Jersey and New York in 1834. The State of New Jersey retains the riparian rights to all the submerged land surrounding the statue and extending eastward to the normal interstate boundary line at the middle of the Hudson River Channel. The actual location of Bedloe's Island is approximately three-eighths land miles offshore from Jersey City, N. J., which is the source of telephone, power, and water services. It is about 1-5/8 land miles from the Battery, at the southern tip of Manhattan Island, New York City. Transportation and mail services are provided by boat from the Battery. At present a privately owned ferry line is operating under contract with the United States Government. THE BOAT for the Statue of Liberty National Monument leaves at Pier A, foot of Battery Place, at the southernmost extremity of Manhattan, New York, every hour on the hour, from 9 a. m. to 4 p. m. When daylight saving time is in effect, departures are made from 9 a. m. to 5 p. m. At certain times during the summer, half-hour schedules are maintained. The ferry is easily reached by Broadway bus, I. R. T. subway, or B. M. T. subway. STATUE OF LIBERTY National Monument is a unit of the National Park System owned by the people of the United States and administered by the National Park Service of the Department of the Interior. A superintendent, as representative of the National Park Service is in immediate charge of the monument. Also employed by the National Park Service to serve the public on Bedloe's Island are guides, guards, historical aids, and an elevator operator. All communications concerning the monument should be addressed to the Superintendent, Statue of Liberty National Monument, Bedloe's Island, New York 4, N. Y.